We recently released some new additions to the Casino Review WordPress Plugin. More updates and additions are in the works and feel free to email us if you have an suggestions for improvement or growth. You now can choose versions 3 and versions 4 of the custom casino widget, see screenshots below. We have now added a new shortcode table, version 3, which is you typical comparison table. You are now able to choose whether or not the featured casino shortcode version 1 will link to review or outbound visit link. 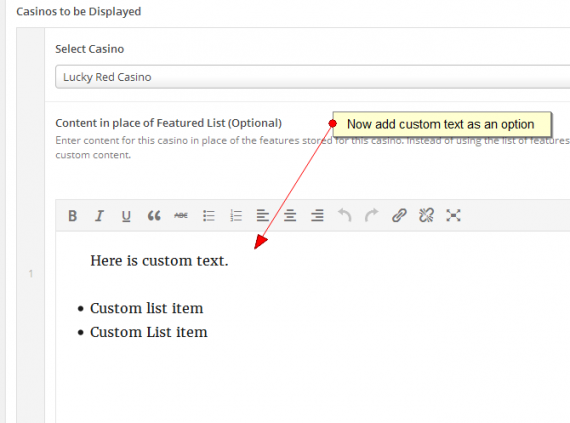 Another new featured is ability to add custom text to the CTA rather than the features from the casino. So you can customize this shortcode content per page or post rather than having the same features on each.